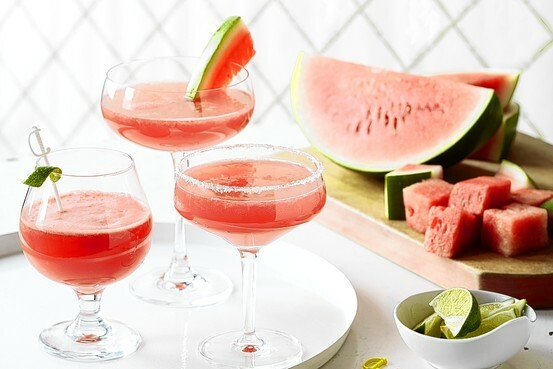 Lush Fab Glam Inspired Lifestyle For The Modern Woman: Beat The Heat Wave: Sip on a Deliciously Refreshing Watermelon Daiquiri! Beat The Heat Wave: Sip on a Deliciously Refreshing Watermelon Daiquiri! We've got the perfect drink to help you stay cool and refreshed during the heat wave that's descended on the eastern and central states. The mouth watering, red watermelon fruit has a natural sweetness and is made up of 92% water to keep you fully hydrated. For the health-conscious minds, watermelon is also rich in vitamins A, B1, B6, C and antioxidants. You're certainly missing out if you haven't tried a watermelon daiquiri, see below for our recipe. Muddle watermelon in the bottom of mixing glass. Add rum, lime juice and simple syrup and shake vigorously with ice. Strain into chilled daiquiri cocktail glass. Garnish with melon slice and enjoy. 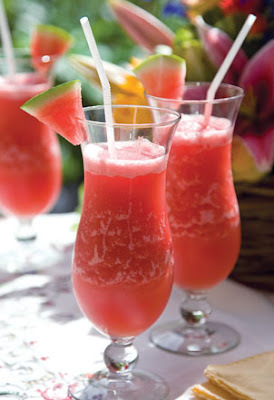 Will you be trying our watermelon daiquiri recipe? Leave a comment below. OHHH this sounds perfect right about now! Having one of these as soon as I get home. Craving watermelon after seeing this.